Vegan food on the Sunshine Coast has evolved; no longer when seeking a wholesome meat-free meal are you left tossing up between hot chips, garden salad or a combo of the two. Granted they’re both great options, but there are just so many more ways to slice, dice, chop and spin vegetables into tasty creations on a plate. Whether you claim to be vegan, vegetarian or you’re an omnivore looking for a nutritional top-up, here’s where to find the best vegan food on the Sunshine Coast. Although they don’t flash the vegan flag too loudly in the face of the public, there’s not an ounce of doubt that Lola’s Pantry presents some of the most elegantly prepared plant-based meals on the Sunshine Coast. That’s what you’d expect of ex-Urbane chef, Alejandro Cancino who left Brisbane to explore the Sunshine Coast’s world of vegetables, fruits and nuts in collaboration with some of the region’s best local food suppliers. One spoonful of Lola’s Pantry Unreal Mac and Cheese, and you’ll be totally hooked. Any vegan on the Sunshine Coast can vouch for the level of difficulty in locating ramen based on vegan broth. It’s near impossible, unless you know about Umami Ramen in Maroochydore and their creamy broth of mushrooms, soy milk and kelp-based seasoning topped with grilled lotus root, fried onion, wood ear mushroom, bok choy and baby corn. Bridging the gap between health and your social life, Elixba dishes up some of the tastiest vegan food on the Sunshine Coast. This slice of plant-based paradise in Maroochydore has a strong focus on wholesome made-from-scratch meals, including soul warming starters, brilliant burgers and bountiful bowls. The humble burger that started it all features an all-star line up of ‘the best plant-based patty’ with caramelised onion, salad and juicy tomato smothered in a cheezy, smoky BBQ sauce. You’ll know where to find us when lunch time cravings hit. When searching for gourmet vegan food on the Sunshine Coast, specifically pizza, look no further than Live Foods Cafe who are constantly spinning out meals backed by a 100 percent ethical and cruelty-free ethos. Their version of a roasted pumpkin and walnut pizza drizzled with balsamic is so good, there’s no doubt you’ll be returning for a second slice. Maintaining a clean reputation, free from refined sugars and processed food, Coconut Head is a healthy little spot that’s found its niche within the Sunshine Coast community by delivering superfood smoothies and bowls to the masses. Located directly opposite Noosa Main Beach, Coconut Head provides everything any herbivore en route to the beach needs, and our drink of choice; the Greena Colada with its banana, pineapple, mango and kale blend is simply delish. Filling the need for burgers in our list of the best vegan food on the Sunshine Coast, Moo-Free Burgers in Maroochydore is the answer to every meat-free burger lover’s prayers with a menu boasting 100 percent plant-based patties topped with fresh salads and handmade sauces on a gluten-free bun, or no bun at all. It’s completely true, you can stick to your animal-friendly morals, and eat your burgers, too. Dive into the benefits of a plant-based menu at Cafe Vie in Buderim where worshipping vegetables is a common thing. The team is consistently knocking out meals that are so playfully creative, you won’t be able to hide your first-bite blushing cheeks when chomping down a menu of cheesy tofu scramble burgers, jackfruit steamed buns and unreal burgers. We’re totally into this plant kinda thing. Located within Maroochydore’s Coastal Wellness Centre, Cafe Nurcha is your one-stop shop for nourishing plant-based food and vibes that are always spot-on. The whole cast is here, including an all-day breakfast menu, lunch, pizza and if you want our tip; whatever meal wins your vote, side it with Nurcha’s famous loaded wedges. You can never go wrong with garlic and thyme potato chunks topped with smoky jackfruit, rainbow slaw, aioli and chilli jam. Providing the means to get you happy dancing in your seat, VanillaFood is a beautifully designed, wholesome cafe in Noosa Junction, busting out a menu free of preservatives, additives, refined sugars, artificial colours and flavours. Whilst they do serve eggs, bacon and the like, you’ll find more than enough vegan options to fulfil your plant-loving heart’s wildest desires, and we think their vegan gnocchi served with garden peas, coconut feta, toasted hazelnuts, fresh lemon and micro greens should fast-track its way to the top of your Sunshine Coast vegan food list. 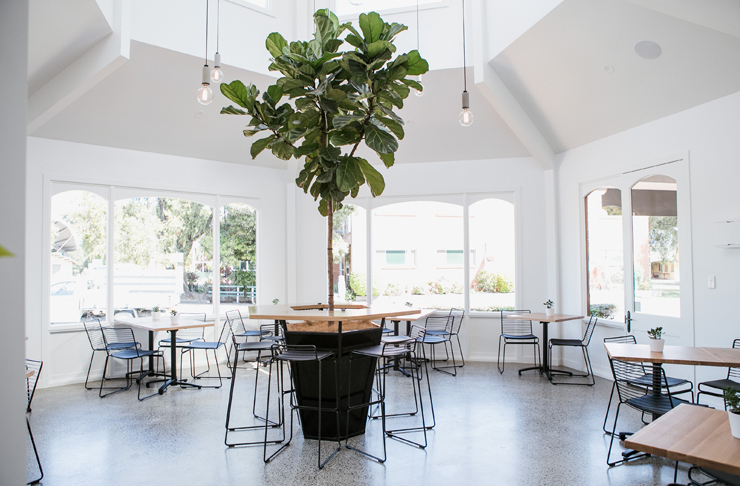 New Earth Cafe is a plant-powered cafe blending all the elements of raw, organic, gluten and dairy-free diets to satisfy even the most stubborn diner. Based in Coolum, the entire menu, including nut milks, breads, wraps, and sweets are made onsite to ensure you receive the finest quality vegan meals when stopping in. Where else can you find vegan-friendly protein pancakes, cooked or raw, with your choice of choc berry, apple caramel, snickers or savoury pesto toppings? 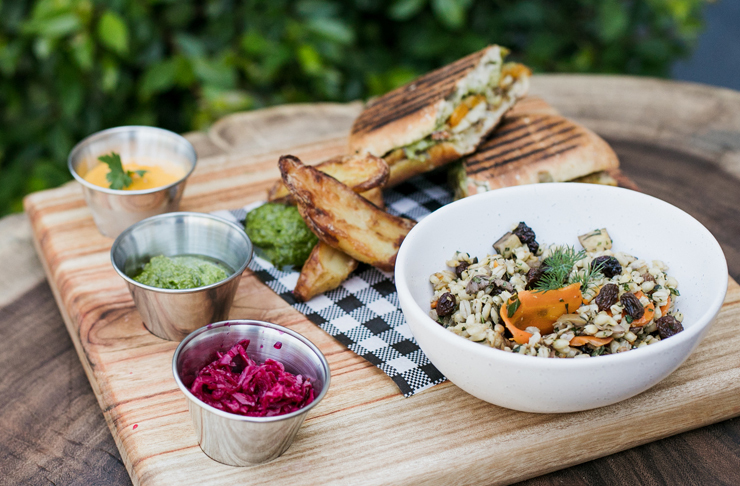 When you grace the bustling hub of Kunara Cafe with your presence, you’ll be rewarded with high-quality, vegan-friendly food created in a certified organic kitchen and served within the grounds of their Forest Glen nursery and store. The meals aren’t only delicious, they’re abundantly nutritious and cater to all the dietary conscious folk among us, including those who enjoy vegan, vegetarian, gluten-free, dairy-free and paleo friendly meals. Do yourself a favour and complete your meal with a Cocowhip dessert. Mooloolaba’s CK Wholefoods is the place to visit when you’re hanging out with a crowd that doesn’t entirely share your vegan views. They are a coffee bar, eatery and grocer that proudly supports local growers and farmers whilst delivering healthy alternatives in the meat and non-meat formats, including one helluva Vegan Veggie Poke Bowl full of seasonal greens, vegetables, toasted grains, avocado, lemon olive oil and your choice of protein. The place to go when you want to take your non-vegan mates to lunch, but you don't want to hear them complaining about the "rabbit food". Trust us, they won't even know that the hotdogs, cheezeburgers and tacos aren't the real deal. Delicats is where it's at for some of the best vegan food on the Sunshine Coast. If you prefer cooking up a feast in the comfort of your own home, round up your fresh produce at the best markets on the Sunshine Coast.